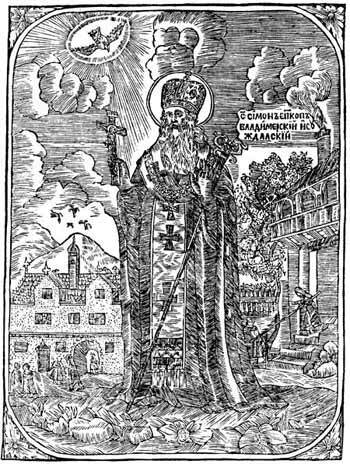 Saint Simon, Bishop of Vladimir and Suzdal was an author of the KIEV CAVES PATERIKON, and he became a monk at the Monastery of the Caves, sometime in the second half of the twelfth century. In the year 1206 he was appointed igumen of the Vladimir Monastery of the Nativity of the Theotokos, and in 1214, at the wish of Prince George Vsevolodovich (+ 1238), he was made the first bishop of Vladimir-on-the-Klyazma and Suzdal. In 1218 he consecrated a church at the Nativity monastery, and in the year 1225, a cathedral church at Suzdal. The Great Prince deeply respected Saint Simon and was prepared to establish a new bishop’s See at Suzdal for his friend, the monk Polycarp of the Kiev Caves monastery, who sought after spiritual glory. Saint Simon, seeing that Polycarp was not yet ready to assume such an office, talked the Great Prince out of his idea, and he wrote a deeply moving letter to Polycarp, in which he offered his friend advice on overcoming his spiritual shortcomings. Saint Simon’s own inner life, character, and virtue are also revealed in the epistle. Saint Simon was known as a learned teacher, and his epistle to Polycarp was placed at the beginning of the KIEV CAVES PATERIKON. On the eve of his repose in 1226, the saint received the schema. Initially his body was buried at Vladimir, but later, in accordance with the saint’s last wishes, his body was transferred to the Kiev Caves Lavra, where it rests in the Antoniev Caves.